Eamonn sits in for Carl this New Year's Eve and links a hymn by Timo Alakotila; pianist-composer Aaron Parks, from a new solo CD; part of Rachmaninov's second piano sonata; a topical song by Frank Loesser; Dave Swarbrick paired with Martin Carthy; Max Bruch's "Scottish Fantasy"; 2 recordings by Joni Mitchell; a cover of Joni's "Marcie" by Anne Sofie von Otter and Brad Mehldau; Howard Skempton's "Song At The Year's Turning"; jazz musician Milt Jackson (see video); and recordings by Mary Chapin Carpenter and Jane Siberry. Music Network presents multi-instrumentalist Dirk Powell, piper Michael McGoldrick, fiddle-player Brendan Gleeson and guitarist Francis Gaffney on tour in January 2014. 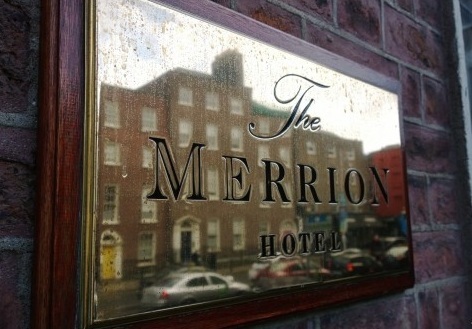 We're offering "The Blue Of The Night" listeners a chance to win a pair of tickets for the Dublin date, at The Sugar Club, on Tuesday, January 7th, along with a double room and breakfast for two at the 5-star Merrion Hotel (pictured). For further information, tune in to Monday's show on December 30th, or visit the Music Network website. Eamonn sits in for Carl on Monday, Tuesday and Wednesday of this week. Tonight's mix includes the Tokyo String Quartet; guitarist Richard Gilewitz; flautist Michael McGoldrick (see video), on an Irish tour, early in January; cellist Anne Gastinel; vibes-player Milt Jackson (the vibes-player featured all this week); a memory from Emerson, Lake & Palmer; the performance of an André Campra requiem by the orchestra and choir of la Chapelle Royale; and Ahmad Jamal, in advance of his appearance in Dublin next month. Tonight’s delights include 2 symphonic poems by Franz Liszt; Chucho Valdes, from the CD “Fantasia Cuba”; one from the seminal “Penguin Eggs”, recorded by folk singer/guitarist Nic Jones (see video); Havana-born Harold Lopez Nussa; lutenist Paul O’Dette; Stina Nordenstam, singing “Soon After Christmas”; part of a piano sonata by Eliran Avni; Clifford Brown with strings; and more from Tallis Scholars. This Saturday's BLUE includes a vocalese “Moanin”; more from the Tallis Scholars; the prelude from Wagner’s “Lohengrin”; recordings by John Martyn and Tim Buckley; Armenian jazz pianist Tigran Hamsyan; part of a symphony by Einojuhani Rautavaara; sax-man Zoot Sims, playing a Gershwin brothers tune; Mary Chapin Carpenter, in advance of her appearance with Altan at next month’s Temple Bar TradFest; and Aldo Ciccolini (see video) plays a waltz by Germaine Tailleferre.